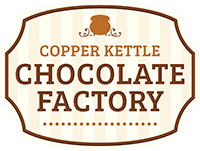 Copper Kettle Chocolate Factory opened for business in Cypress, Texas on November 29, 2014. Copper Kettle brings fine chocolates to Cypress and the Houston metropolitan area. Browsing through Copper Kettle you will find a vast assortment of chocolates made on site, including Almond Toffee, Texas Turtles, Creams, Truffles, Nut Clusters, Bark, Hand-Dipped Cookies and Pretzels, Dipped Treats and so much more. Scott and Carrie Kossoudji own and operate Copper Kettle Chocolate factory. Scott started Copper Kettle Chocolate factory after a 14 year career as a trial attorney. Prior to his law practice, Scott proudly served in the United States Navy as an Explosive Ordnance Disposal Technician. After leaving the Navy, Scott attended law school at The Ohio State University. After graduating from law school, Scott practiced law as a commercial trial attorney. During the past 14 years, when his law practice allowed, Scott worked with his parents who have been making fine chocolates for more than 30 years, to learn the craft of making exceptional chocolates. In 2012, Scott and Carrie decided to pursue their dream of opening a fine chocolate shop that caters to everyone. For nearly 2 years, Scott and Carrie planned for the opening of The Copper Kettle Chocolate Factory. In November of 2014, they made their dream a reality and Copper Kettle Chocolate Factory opened its doors. Copper Kettle Chocolate Factory strives to produce the very best chocolates by using only the finest ingredients in recipes developed over three decades.